PACK & SEND Parcel or Large Item National and International Delivery Service. We provide a ‘Pack & Send Service’ for a wide range of items at our Coventry Distribution Centre. Whether it is an item you have sold on ebay, a present or package to a friend or a family member, we can take the hassle out of packing and shipping your it. Our rate for standard sized parcels starts at just £4.70 + Vat with oversized parcels and packages still available at massively discounted rates on either a next working day, two working day or even a same day delivery service. We can pack your items securely and ship them to any UK or international destination. To Benefit from our Pack & Send Service simply bring your item into our Coventry Depot and one of our professional packers can pack the item while you wait (depending on the complexity & time of day) – or you can just leave it with us for convenience. 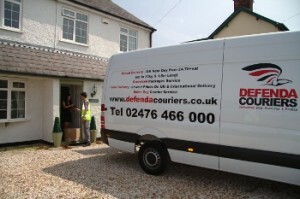 You can choose from a range of delivery options to any destination either UK, European or any other Worldwide location. We offer the cheapest way to send ebay sales either from our Depot or by collecting from your home or business premises. Our convenient location in Coventry means our Pack and Send Service is ideal for customers in Coventry, Nuneaton, Bedworth, Solihull, Sheldon, Shirley, Leamington Spa, Kenilworth, Balsall Common, Hampton In Arden, Meriden, Knowle, Berkswell, Dorridge and Bickenhill. Customers from even further afield are also regular visitors trusting our expertise to ensure the safe shipping of their goods. A huge range of packaging materials including: boxes, postal tubes, bubble wrap, brown wrapping paper, protective foam and corrugated paper rolls are available to ensure your items arrive in pristine condition. Wooden crates can be produced to add extra protection where needed. Your delivery options will be largely dependent on the type of items you are sending and the urgency of getting them to their destination. Our standard next day service is available to nearly all UK destinations and starts at just £4.70 + Vat (excluding packing service) for multiple item shipping. For one-off packages the price is just £6.95 + Vat (excluding packing service). These prices cover items weighing up to 30 kg with any single dimension not exceeding 150cm (1.5m or 1500mm). Larger items can be sent but will be dealt with on a two working day delivery basis and incur an additional charge. This service is for items that are bigger than can be processed through our next day service but not so large as to require a dedicated Sameday or Next Day vehicle delivery. Some smaller items to the more remote areas of Scotland will also fall into this delivery service. This service is ideal for large items that do not lend themselves to being processed through a hub and conveyor system such as bikes, pushchairs, palletised goods etc. The price will be dependent on distance from our depot. Fragile items such as valuable artwork, Porcelain objects or other highly valuable products and even antiques may be best suited to being transported via a dedicated vehicle on a sameday or next day delivery. The cost will again depend on the distances involved – but our competitive rates should ensure that this premium delivery service is a viable means of delivering your goods. If you are a regular sender of packages but struggle for space to store your items, our Pick, Pack, Send service may be the answer. We will store your items and pick them, pack them and send them as per your instructions. Contact us for details of warehouse storage, pallet storage at our Coventry warehouse units.